Cortijo Amaya has 10 guest rooms: 3 family rooms for 3 or 4 persons, 6 double rooms with either a double bed or two single beds and 1 single room. In some rooms, a cot can be added. 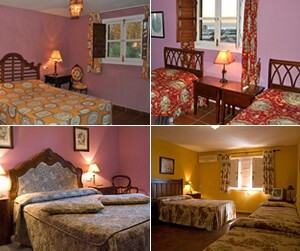 All our rooms are decorated in an authentic Andalusian style and have WIFI, air-conditioning and a TV. All rooms have a private bathroom, including soap, showergel and a hairdryer.